All myths are laced with metaphors - many leading to gods and creators as ancient alien who came to Earth to create a race called humans and what followed after that. Reality is a computer generated consciousness hologram in which the characters it creates are programmed to believe it is real. It is a game of illusion, delusion (deluge), perception and deception and it's about to end. Clinging to their belief in the goodness and power of their gods and wondering about their sins and the toil and strife with which they lived, the Sumerians imagined a past in which people lived in a god-created paradise. This was expressed in the same poetic tale that described the conflict between the king of Uruk and the distant town of Arrata the earliest known description in writing of a paradise and the fall of humankind. The poem describes a period when there were no creatures that threatened people - no snakes, scorpions, hyenas, or lions a period in which humans knew no terror. There was no confusion among various peoples speaking different languages, with everyone praising the god Enlil in one language. Then, according to the poem, something happened that enraged the god Enki (the god of wisdom and water who had organized the earth in accordance with a general plan lay down by Enlil). The clay tablet on which the poem was written is damaged at this point, but the tablet indicates that Enki found some sort of inappropriate behavior among humans. Enki decided to put an end to the Golden Age, creating conflict, war, and a confusion of languages. On another clay tablet, surviving fragments of a poem describe the gods as having decided that humans were evil ... and the gods as having created a flood (collective unconsciousness, consciousness grids) to destroy the seed of humanity - that raged for seven days and seven nights. The tablet describes a huge boat commanded by Sumerian King Ziusudra - the last king listed on the Sumerian king list prior to the deluge. He preserved vegetation and the seed of humankind. When the storm subsided, the god Utu - the sun - came forward and shed light on heaven and earth. King Ziusudra opened a window on the boat and let in the light. He is subsequently recorded as the hero of the Sumerian flood epic. Heaven and Earth were once a mountain that rose out of the primeval Sea. The mountain's peak reached into Heaven and its base was the Earth. An was heaven, and Ki was Earth. Nammu is the Sea goddess that surrounded the Earth. She was also the original dark chaos out of which everything formed. The mountain rose up out of the blackness of the deep sea. 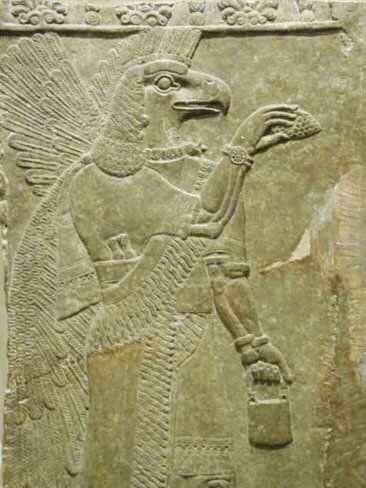 Enlil, the Air god, separated Heaven and Earth and gave birth to the dawn. Enlil raped Ninlil the Air Goddess, and she gave birth to the Moon god, Nanna. Nanna and Ningal, his consort, gave birth to Utu, the Sun. Thus the Moon was born out of the darkness, before the Sun. This may be an indicator of the earlier matriarchal religion. Nanna and Ningal also gave birth to Inanna, the Evening Star. In about 3000 BC the Sumerians in the Middle East also had this account of Creation. The god of the waters, Enki, told his mother, Nammu, to take bits of clay and mold the shapes of men and women. She made perfect people of every sort to be servants of the gods. Then Enki and his wife, the Earth goddess, had a contest. Each tried to invent people for whom the other could find no place or task. Thus each created various sorts of deformed and disabled individuals. This was how the Sumerians explained human imperfections. ...Nergal, [the deified] Gilgamesh, Ereshkigal [the queen of the underworld, who is either given to Kur in the underworld or given dominion over the underworld in the prelude to Gilgamesh, Dumuzi [the shepherd, Inanna's husband], Namtar, Hubishag, and Ningishzida - each in his own palace; he also presented gifts to Dimpimekug and to the "scribe of the nether- world."... [After arriving at his assigned spot] ...certain of the dead were turned over to him, perhaps to be his attendants, and Gilgamesh, his beloved brother, explained to him the rules and regulations of the nether world. Another tablet indicates that the sun, moon, and their respective gods, spent time in the underworld as well. The sun journeyed there after setting, and the moon rested there at the end of the month. Both Utu and Nanna '''decreed the fate' of the dead" while there. Dead heroes ate bread, drank, and quenched the dead's thirst with water. The gods of the nether world, the deceased, and his city, were prayed to for the benefit of the dead and his family. The Sumerian version of Gilgamesh includes a trip to the nether world as well. In the prologue, Enki sails for the Kur, presumably to rescue Ereshkigal after she was given over to Kur. He is assailed by creatures with stones. The main body of the tale includes a trip to the nether world as well. Enkidu enters the "Great Dwelling" through a gate, in order to recover Gilgamesh's pukku and mikku, objects of an uncertain nature. He broke several taboos of the underworld, including the wearing of clean clothes and sandals, 'good' oil, carrying a weapon or staff, making a noise, or behaving normally towards ones family. For these violations he was "held fast by 'the outcry of the nether world'". Intervention by Enki, rescued the hero. Inanna also visits Kur, which results in a myth reminiscent of the Greek seasonal story of Persephone. She sets out to witness the funeral rites of her sister-in-law Ereshkigal's husband Gugalanna, the Bull of Heaven. She takes precaution before setting out, by telling her servant Ninshubur to seek assistance from Enlil, Nanna, or Enki at their shrines, should she not return. Inanna knocks on the outer gates of Kur and the gatekeeper, Neti, questions her. He consults with queen Ereshkigal and then allows Inanna to pass through the seven gates of the underworld. After each gate, she is required to remove adornments and articles of clothing, until after the seventh gate, she is naked. The Annuna pass judgment against her and Ereshkigal slays her and hangs her on the wall. Inanna is rescued by the intervention of Enki. 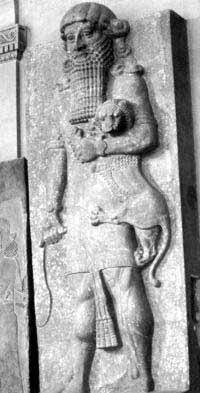 He creates two sexless creatures that empathize with Ereshkigal's suffering, and thereby gain a gift - Inanna's corpse. They restore her to life with the Bread of Life and the Water of Life, but the Sumerian underworld has a conservation of death law. No one can leave without providing someone to stay in their stead. Inanna is escorted by galla/demons past Ninshubur and members of her family. She doesn't allow them to claim anyone until she sees Dumuzi on his throne in Uruk. They then seize Dumuzi, but he escapes them twice by transforming himself, with the aid of Utu. Eventually he is caught and slain. Inanna spies his sister, Geshtinanna, in mourning and they go to Dumuzi. She allows Dumuzi, the shepherd, to stay in the underworld only six months of the year, while Geshtinanna will stay the other six.